I read the Harry Potter books during my teenage years. J.K. Rowling’s writing, simple yet enchanting, has always brought me to the Wizarding World, even after countless re-reads. I was very excited to hear that Harry Potter: The Exhibition will be shown in Singapore. Partly because I was working on a group project – an advertising campaign for the ArtScience Museum. The scope of Harry Potter allowed me to design A LOT – practically anything can be adapted from the Harry Potter universe into marketing materials. 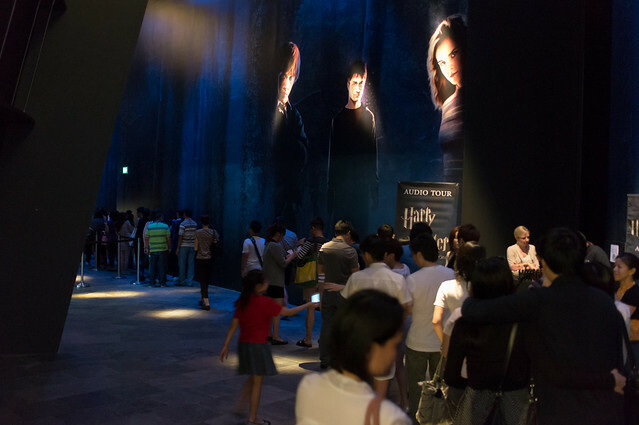 A few months later, Harry Potter: The Exhibition opened at ArtScience Museum, Marina Bay Sands. For the first time in Asia, this travelling exhibition features props and costumes from the Harry Potter film series, including a first-ever complete set of Horcruxes. Featuring artifacts in settings inspired by the film sets, go on a journey through the famous wizard’s world and experience first-hand all the wonders of Hogwarts™ such as the Gryffindor™ common room, Hagrid’s hut, and the Great Hall. Along the way you can pull a Mandrake from its pot, toss a Quaffle in the Quidditch™ area, and encounter centaurs, Buckbeak™ the Hippogriff and a giant Acromantula spider in the Forbidden Forest. 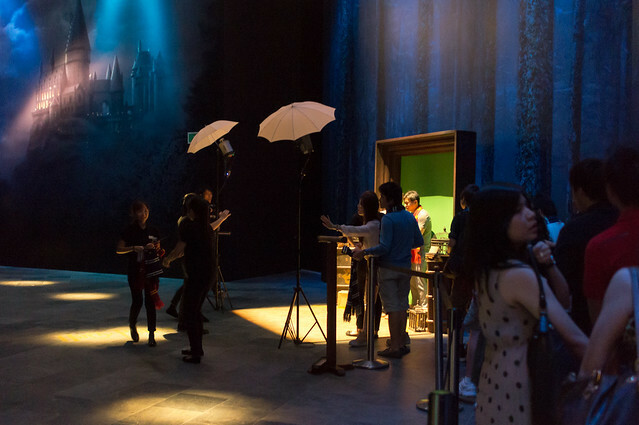 On display for the first time in Asia, Harry Potter: The Exhibition features all your favorite costumes and props like Harry’s wand and eyeglasses, Hermione’s Yule Ball gown, the Golden Snitch™, the Marauder’s Map and so much more. The exhibition takes up most of the space at the Lower Galleries. The Rain Oculus (water feature) at ArtScience Museum has been blocked out to darken the lower level. There is no OCBC credit card 10% discount. Audio Guides are available for rent, at $6 each. They are also available as packages – a $6 extra. The advantage of buying a package is that you pay in advance and receive a voucher for rental (instead of paying at the entrance). Mysteriously, the Senior package costs $8 extra. Edit: This is a typo on Marina Bay Sand’s ticketing website and has been corrected. Audio Guides are $6 for all guests. Audio Guides are handsets (like a remote control) where you input a number to hear commentaries about the props/costumes displayed in the exhibition. Tickets to this exhibition are sold in hour-long blocks. How does this work? You basically can enter the exhibition at the stated time on your ticket. A ticket with “1:00PM ~ 1:59PM” is good for entry during that period. If you run a little late, say 2:15PM, you can still enter the exhibition if the queue isn’t too long. If you forgot about everything and decided to turn up only at 6PM… it is up to the discretion of the museum staff to decide on your entry. Anyway, once you have entered the galleries, you are free to stay as long as you want. Warning: NO RE-ENTRY policy – Do note that once you leave the exhibition shop, you cannot re-enter the exhibition or the shop again. Photography and Video Recording are prohibited in the galleries, but there visitors will be able to take photo of the Flying Ford Anglia (The flying car in Harry Potter and the Chamber of Secrets) located outside the galleries. Also, obviously you are not allowed to touch the artifacts on display EXCEPT for the Quidditch and Mandrake play areas. I visited the exhibition the first day it is opened to public. As expected, it was crowded and the queue for entry started very close to the Museum’s glass elevators. It’s one long queue split into 3 sections – one to get your tickets checked and marked, another to get a photo taken, and then the last one to get into the “pre-show” rooms. The photo spot is a nice set with some trunks, wands and of course, green screen for the magic. As you approach the photo set, the museum staff will offer you a scarf (Gryffindor and Slytherin colours available) and random assortment of wands. Pose, snap, and off you go. The unfortunately-overpriced souvenir photo can be purchased at the shop at the end of the exhibition. Next is a waiting area, where there’s nothing much except for film posters. The next room is the pre-show, where a staff member dressed in robes will perform a “sorting ceremony”. Volunteers are requested to come forward and sit on the stool, while the hat is placed above their heads. The museum staff was quite energetic, but the illusion was broken when the sorting hat’s voice was coming from the other end of the room (rather than anywhere near the hat itself). This lasted about 5 minutes and we were then ushered into the next room. It is a mini theatre with digital displays showing film posters. Once the show begins, the screens were creatively used to show video clips from the film series, eventually morphing into a fast-moving train. A curtain at the right end of this room then lifted up to reveal the Hogwarts Express, as well as another museum staff dressed up in robes, holding a lantern, welcoming guests into the exhibition. From here on, guests are free to roam the exhibition space. There are “hundreds” of props and costumes in 8 themed areas: Gryffindor Common Room, Gryffindor Boys’ Dormitory, Hogwarts Classes, Quidditch, Hagrid’s Hut, The Forbidden Forest, Dark Forces and The Great Hall. Apart from the props and costumes displayed, there are two “play areas” in the exhibition. 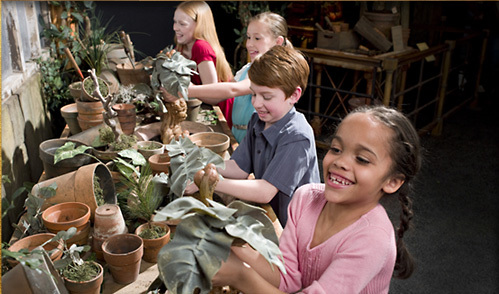 One of them is Herbology, where you can pull up baby Mandrakes and make a LOT of noise. Although I had good fun for a while, it got annoying very quickly (they are very loud!) and wanted to find the switch to turn off the speakers. The other fun zone is the Quidditch area, where there is a place where you can throw Quaffles into hoops. For those who are skilled players of the Basketball machines at Game Arcades, now is your time to shine! There was an abundance of museum staff stationed at all galleries to keep watch. So unless you have some sort of Invisibility Cloak, don’t bother trying to take photos in the exhibition. I’ve seen so many people getting caught (and some people who pretended to be checking messages or making a call with their phones). On the bright side, the staff are very courteous when it comes to stopping guests from taking photos. I’m a fan of the film and book series – I can even recall the crazy passwords to Gryffindor common room. But this exhibition falls short of expectations. My sister toured the exhibition with me and was also shocked that we reached the exhibition shop in about 20 minutes. We really took our time and saw everything. We even spent a lot of time at the “activity zones”. So we walked all the way to the start and gave everything a second look. I’m not trying to bash the exhibition, but I feel that I have read too many (questionably) positive reviews, which I felt are very deceptive. But given as admission is expensive, I expect more. The exhibition does make a lot of promises, but was disappointing. I think it’s important that you know what to expect (especially those intending to bring the whole family) and not feel ripped off at the end. In terms of gallery space, Harry Potter: The Exhibition spans 15,000 square feet. It is smaller than Titanic: The Artifact Exhibition (26,900 square feet). It is a short exhibition. I am not sure if the exhibition lives up to the “hundreds of authentic costumes and props” because some objects have doubtful authenticity, or at least, inaccuracies. Yes, there are a lot of actual props used in the films, but for some, they are pushing it. Hagrid’s costume (Half-Giant size, 8 feet, 2.43m tall) was shown. Robbie Coltrane (acted as Hagrid in the films) and his relevant stunt performer never wore a costume that size. 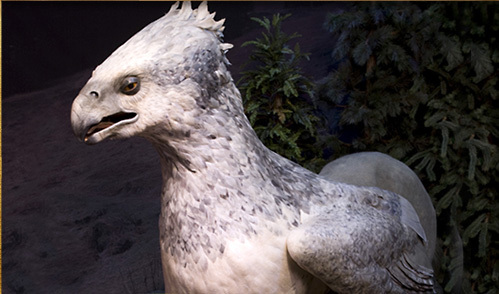 Also, I believe Buckbeak (and some of the creatures) were CGI characters, so how can there be “physical” versions? Another obvious one is the winged Key (in Philosopher’s Stone) having two perfect wings, is obviously not the one Harry captured, despite its description. Yes, I’m being nit-picky here. The props, while displayed in nicely decorated scenes inspired by the films, aren’t very impressive because they are well… static. Is it too much to ask for a Dementor to swoop down on guests? A Howler that actually yells? Animated photographs of Gilderoy Lockhart being cheeky and shameless? I know that this is an exhibition of costumes and props, but it becomes “a lot of imagination required” because it attempts to begin with a highly vivid “magical” narrative, then drifts towards the ordinary. There are some hits and misses with the theming, with some areas looking great, and some (e.g: Great Hall) is perhaps where the organizers ran out of budget. Nothing compared to Warner Bros. Studio Tour London – The Making of Harry Potter or The Wizarding World of Harry Potter. I would say that $24 is a hefty price-tag for such an experience. There is also, a lack of “behind the scenes” look to the films, which I’m sure will be appreciated by all guests. Frankly, I was expecting this exhibition to be like the The Lord of the Rings Motion Picture Trilogy: The Exhibition that was here years ago, which was similarly priced. But it isn’t anywhere close to that. Despite having materials from 8 films to work with, Harry Potter: The Exhibition lacks breadth and depth. I can’t help but feel that the exhibition is really designed to make guests feel interested in buying overpriced “replicas” of the film props in the end. The exhibition shop was so packed, I couldn’t even get out. While there is a large assortment of quality souvenirs, be mindful of the heavy mark-ups! The Souvenir Book, which features photographs of the exhibits and a replica of Harry’s first letter from Hogwarts, goes for S$30. House T-shirts are S$50 each, scarves are S$40 each. A Marauder’s Map replica go for S$50. I saw that the Dumbledore’s Army Wand Collection was going for S$350, but the retail price is actually USD145. Small items like Time-Turners and R.A.B. Locket go for S$100-$120. The retail prices for those items are about USD49. In my opinion, the worst offenders are the “Film Artifact Box”, a collection of printed materials that should not cost more than S$20 even after ridiculous mark-ups. Yes, these prices are before shipping, but shipping can’t be THAT expensive. Of course, you get your hands on the goods immediately and have a large selection to choose from. BUT if you can wait, you can save a lot of money buying the items elsewhere. In short, if you have watched the films in Blu-Ray or IMAX, I don’t think you’ll miss much. Most of the magic of the films were produced with CGI anyway. Otherwise, Harry Potter: The Exhibition is a nice opportunity to appreciate the fine details behind the imaginative and enchanting Wizarding World. Just be wary of what you spend on at the museum shop. I am planning to visit the exhibition when I get back. When I first heard the news, I was expecting something like the HP Studio Tour in UK….. I know! The WB London Studio Tour costs a lot more, but at least there’s a lot of things to see, including animated props and large sets. This exhibition in Singapore just reminds me of the Transformers CybertronCon in some ways..
All my friends are super excited about this exhibition…. I am trying to lower their expectations so that they won’t be too disappointed….. I remember seeing some behind-the-scenes footage about the various creatures, and surprisingly they did use a lot of practical effects. So I believe there was a non-CGI Buckbeak. I went to the london studio tour just last week and it was really amazing! well worth the money spent and the time to travel there (getting there was quite fast from central london actually). I even teared a little when I was at the entrance! The merchandise there were a fair bit cheaper than what I heard was being sold for here. The studio tour focused more on the sets that were being used for filming rather than the props, even though the latter was showcases as well. I am thinking of just going to the MBS one to see what kind of merchandise they are selling. Might buy some stuff that I would have bought in the london one if it wasn’t because of the fear of exceeding my luggage limit. Hi after singapore.. It is possible to exhibit it in other asian country? At this time, the exhibition organizers have only announced that the exhibition will return to to New York at the end of the year. Could I know approximately how long it will take to go through the whole museum? It really depends, but I’d say around 45 minutes to 2 hours, if you visit both Harry Potter: The Exhibition and Andy Warhol: 15 Minutes Eternal. Hi, do you know if you’re able to purchase tickets for the exhibition without pre-booking?